Dermatitis herpetiformis, also known as DH and Duhring’s disease, is a chronic skin condition caused by a reaction to gluten ingestion. The vast majority of patients with DH also have an associated gluten sensitive enteropathy (celiac disease). Extremely itchy bumps or blisters appear on both sides of the body, most often on the forearms near the elbows, as well as on knees and buttocks, and along the hairline. Dermatitis herpetiformis (DH, Duhring’s disease) bumps and blisters resemble herpes lesions, hence the name “herpetiformis,” but are NOT caused by the herpes virus. They are caused by gluten ingestion. While people with DH are at the same risk for the complications suffered by people with celiac disease, as many as 20% of people with DH will have a normal intestinal biopsy. However, DH patients with a normal intestinal biopsy and normal celiac serology (blood test) will still respond to a gluten-free diet. Symptoms tend to come and go, and DH is commonly diagnosed as eczema. Symptoms normally resolve with a strict, gluten-free diet. DH affects 10-15% of people with celiac disease. DH patients frequently have no digestive symptoms. DH affects 10-15% of people with celiac disease. DH patients frequently have no digestive symptoms. DH can affect people of all ages, but most often appears for the first time in those between the ages of 30 and 40. People of northern European descent are more likely than those of African or Asian heritage to develop DH. The condition is somewhat more common in men than women, and men are more likely to have atypical oral or genital lesions. How does a disorder that damages the intestines show up on the skin? “When a person with celiac disease consumes gluten, the mucosal immune system in the intestine responds by producing a type of antibody called immunoglobulin A (IgA),” explains John Zone, MD, Celiac Disease Foundation Medical Advisory Board Member and Chairman of the Department of Dermatology at the University of Utah School of Medicine. These IgA antibodies are directed against epidermal transglutaminase. The antibodies then travel to the skin where they bind with the epidermal transglutaminase protein. Gluten ingestion seems to trigger this reaction. 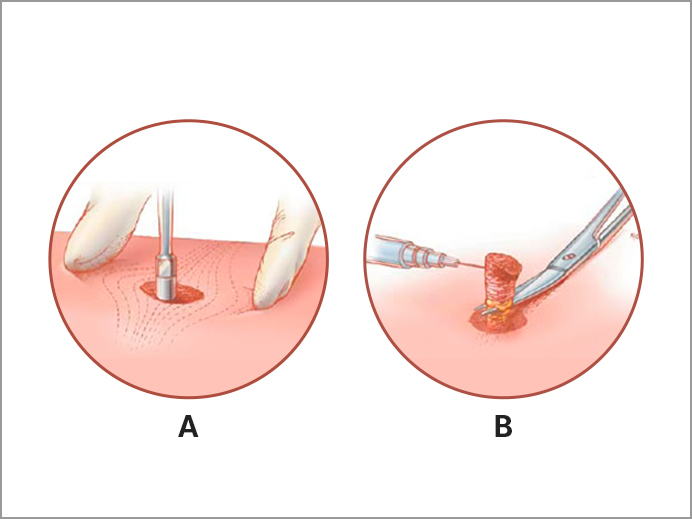 A skin biopsy is used to confirm a diagnosis of DH. Dermatologists usually use what’s called a “punch biopsy” to remove the skin and test it for dermatitis herpetiformis. After injecting a local anesthetic, your dermatologist will use a tiny, cookie-cutter-like punch to remove a 4mm sample of skin. The incision can be closed with one stitch, and generally heals with very little scarring. A skin sample is taken from the area immediately next to a lesion and a fluorescent dye is used to look for the presence of Immunoglobulin A (IgA) deposits that appear in a granular pattern. Skin biopsies of people with DH are almost always positive for this granular IgA pattern. It is important to have your dermatitis herpetiformis skin biopsy performed by someone who has diagnosed the skin condition before and knows how to do the biopsy. The skin sample must be taken from skin directly adjacent to the suspected dermatitis herpetiformis lesion, as opposed to directly from the lesion, since inflammation in the lesion can destroy the IgA deposits. Blood tests for other antibodies commonly found in people with celiac disease –antiendomysial and anti-tissue transglutaminase antibodies – supplement the diagnostic process. If the antibody tests are positive and the skin biopsy has the typical findings of DH, patients do not need an intestinal biopsy to confirm the diagnosis of celiac disease. If you are diagnosed with dermatitis herpetiformis, your dermatologist may prescribe dapsone for short-term relief from the itching. According to Dr. Zone, the rash responds dramatically to dapsone, usually in 48 to 72 hours. People who can’t tolerate dapsone may be given sulfapyridine or sulfasalazine instead, although these drugs are less effective. However, you’ll still need to follow a strict gluten-free diet to control your dermatitis herpetiformis. Even with a gluten-free diet, dapsone or sulfapyridine therapy may need to be continued for 1–2 years to prevent further DH outbreaks. In some cases, a diet high in iodine may worsen DH symptoms. If you are experiencing DH flare-ups, you should consult with a dermatologist expert in celiac disease to determine if foods or medicines high in iodine are the cause.